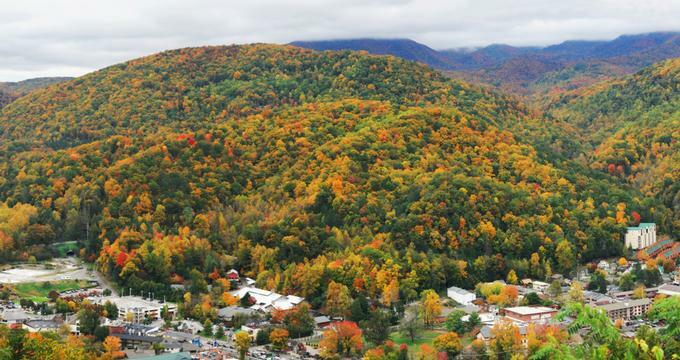 Gatlinburg is a mountain city in Tennessee. It is popular to tourists because this is where they can get to Great Smoky Mountains National Park, a beautiful 520,000 acre destination filled with sights and activities for all those who visit. It’s not difficult to find breathtaking views of the park from Gatlinburg, may it be on the 407-ft. Space Needle Observation Tower or the 2.1-mile long Sky Lift, a cable car that travels from the Downtown area all the way to the Ober Gatlinburg. Considered to be one of America’s premium outdoor destinations, Gatlinburg offers all kinds of fun activities to visitors as well. They have whitewater rafting, downhill snow skiing, golf, fishing, and even hiking. Thinking of going there to have fun for a couple of days? Then you’re going to want to book a good place to stay. Here are a couple of cabins you might want to look into. Honeymoon Hill is well known as a romantic getaway in Gatlinburg, with cabins featuring heart-shaped Jacuzzis for two and lots of privacy for couples in a cozy environment with fireplaces and more. Honeymoon Hill features a wide selection of cabin accommodations designed to cater to the different preferences of its guests. For one, they feature several cabins that offer guests breathtaking mountain views while they enjoy their heart-shaped outdoor Jacuzzi for two. They also have cabins that can accommodate groups of six, featuring a 6-person outdoor tub and a private 2-person Jacuzzi. There are also creekside cabins that are great for families and larger groups. Whatever you choose, these cabins offer utmost privacy and a complete set of amenities, letting you have everything you need throughout your stay. The place is also a well-known venue for all kinds of weddings. Honeymoon Hill has its own wedding chapel that works as a charming venue for the ceremony. It accommodates as a average number of people, making it ideal for intimate gatherings. The ceremony can also be held in a less traditional venue - a gazebo by the creekside, allowing for an outdoor ceremony with the beautiful views as a backdrop for the couple as they exchange their vows. But if couples want the perfect backdrop, then they can choose to hold the ceremony at the Smoky Mountain Overlook. - Adventure Park Zip Lines/Legacy Mountain: guests will experience a series of zip lines that just gets better and better as they reach the end of the course. Alternatively, they can opt to experience Legacy Mountain, an adventure composed of zip lines, rope bridges, ATV riding, and breathtaking views. - Amazing Animals Exotic Animal and Pet Show: Enjoy an adorable cast of furry and feathered friends that will leave its audience laughing. - Smith Morning Variety Show: Guests can start their day off with an amazing variety show made up of award-winning pop, country, and even gospel hits, lots of comedy, and other amazing performances. - Comedy Barn Theater: Arguably one of the most hilarious performances out there, the Comedy Barn Theater offers side-splitting humor for the entire family. The show also comes with animals, magicians, jugglers, and other performers, all ready to give guests a night of laughs. - Country Tonight Music Show: A show filled with dancing and singing with comedy and patriotism on the side. - Darren Romeo, Magic Beyond Belief: Prepare to be mesmerized by this award-winning magician who will wow the audience with illusions and other magic tricks. - Hatfield and McCoy Dinner Show: The features a long standing family fued between the Hatfield and McCoys, entertaining guests as they try to settle their differences in a funny and remarkable way. It’s a comedy show like no other. - LazerPort Fun Center: guests will be able to access one of six go kart tracks of their choosing, or play light mini golf, or experience the huge laser tag arena. - Ripley’s Aquarium of the Smokies: Home to over 10,000 exotic marine life that represents about 350 different species - definitely one of America’s most fun aquariums to visit. - Smoky Mountain Opry: known as the largest variety show and musical in the country, the Smoky Mountain Opry features Big Bang Swing and a whole cast of comedians, dancers, singers, musicians, performing in dazzling costumes and special effects. - Titanic: A museum dedicated to the ship, its passengers, and crew. Every person who visits the attraction also gets an actual Titanic boarding pass. - The Great Smoky Mountain Wheel: a ferris wheel that’s 200 feet tall, giving its riders breathtaking views of the Great Smoky Mountain National Park. The best part is that qualified guests will receive a ticket for each of these attractions per night, which means that you’ll always have something fun to look forward to! - Gatlinburg Cabins: secluded and of different sizes, these cabins are on mountain top locations to give guests the best mountain views. - Gatlinburg Cabins: these are cabins that can accommodate up to 16 people while still giving them enough room to relax and enjoy their privacy. It comes with a big screen theater as well as a game room where you can play pool, air hockey, or foosball. - Special Cabins: Hemlock also has cabins that are near certain points of interests such as the Rocky Top Sports World, Ripken Baseball Complex, and LeConte Convention Center. - Pet Friendly Cabins: for when you plan on travelling with your furry friend. Hemlock Hill is also an ideal venue for weddings and other events. They have their own wedding chapel that’s up for rent, which can be ideal for intimate wedding ceremonies as well as all kinds of spiritual retreats. Should you reserve a cabin, the chapel will be free to use. Indeed, Gatlinburg is a great place to visit by yourself or with family. While there might be a lot of other cabins out there that can accommodate your stay, you may want to look at these two first.